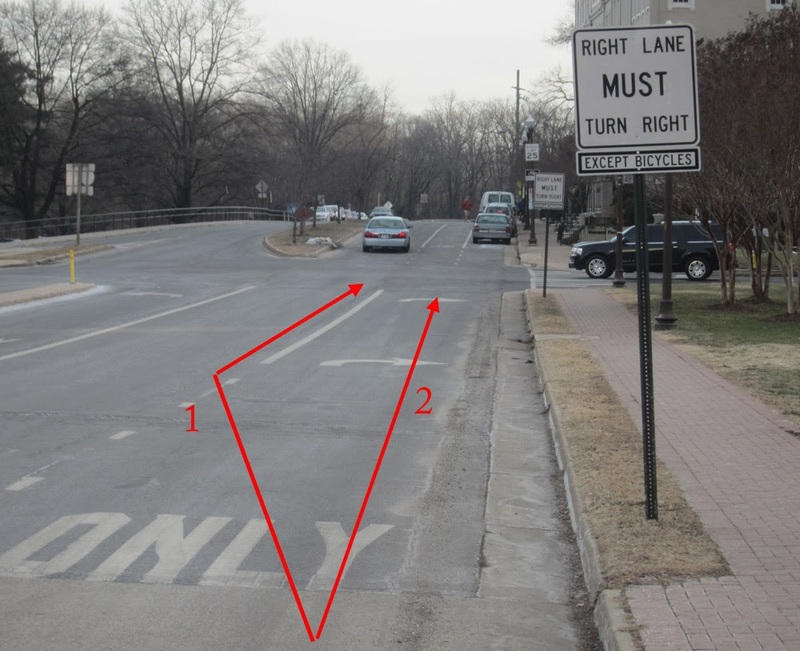 On the south end of the Meade St. Bridge in Rosslyn, a new sign states, "Right Lane Must Turn Right, Except Bicycles." The exception for bicycles recognizes the wrong-headed hostility that motorist sometimes display toward bicyclists apparently riding in the center of the road. But those cyclists are actually choosing the better way. A cyclist riding on the edge of the road and going straight through the intersection will take path 2 above. Unfortunately, such cyclists run the risk of the dreaded "right hook." That's getting hit by a car taking a right turn right in front of you. For calm-nerved cyclists and motorists, a better choice is for the cyclist to move out just to the left of the right turn lane. The cyclist is then more clearly visible to motorists. Motorists wanting to turn right can come in to the right of the cyclist and have a clean right turn. Motorists shouldn't always get upset at cyclists riding away from the edge the road. Cyclists moving away from the edge of the road can make for safer, more smoothly flowing traffic.